Payment -Secured Transaction with Paypal. All major credit/debit cards are accepted. At Fly-Belts, we know that online payment is a big issue and a matter of trust. We guarantee a 100% secured transaction thanks to our payment gateway : Paypal, which represents more than 20% of global online payments. Contrary to what many believe, there is no need to create an account : just fill your regular credit/debit card information like any bank payment's solution. Fly-Belts will never be aware of your financial details. Why Fly-Belts can be trusted ? The transaction is based on a 256 SSL security certificate encryption that allows a unique connection between your computer and Paypal's servers. This encryption system is 100% reliable and cannot be hacked, It is trusted by more than 230 million users all around the world. Fly-Belts has a Verified Account with Paypal to get an even more secured transaction. We will never be aware of your financial information, it is fully confidential between Paypal & your bank. How can I pay my Fly-Belts ? Once you have filled your billing & shipping informations, you select the payment method, Paypal, and then you click on the "Place Order" button. 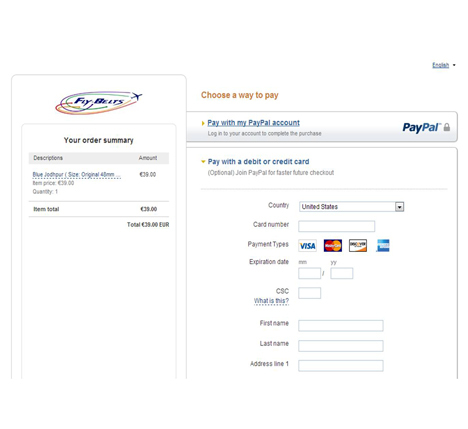 You will be redirected to the secured Paypal page that you can see on the right. Fly-Belts logo is a proof that the connexion is secured. To ensure the transaction, Fly-Belts' name & logo are displayed at the top of the screen, along with your order summary. Then fill & review your financial details before pushing "Continue" button and make the payment. You will then receive an automatic confirmation email from Paypal. © 2014 Fly-Belts. All Rights Reserved.